Welcome back! It’s so nice to see you again. Starting this blog has been one of the biggest thrills of my life. Of course, my marriage and children are up there at the top, but this blog has been more thrilling than I could have imagined. I have met people from all over the United States (where I live) and all around the world. This has really allowed me to learn so much about food. We all eat differently and use different preparation methods. I cherish the wonderful friends that I never would have known if it were not for the creation of this blog. I hope you all know who you are. OK………I’m done being sappy. Time to get practical. One of the things I hear over and over and over is, “I can’t afford to eat real food.” My easy answer is, “How do you think you can afford not to?” Illness and disease are expensive. Missing work because you are sick is expensive. Easy enough for me to say, right? I’ll be real up front with you. Money is tight for my family. Super tight. We make a decent buck, but the cost of health insurance, our mortgage, 6 mouths to feed, and college tuition for my oldest……….there is no extra money in our budget. I can’t afford to waste money on expensive food. 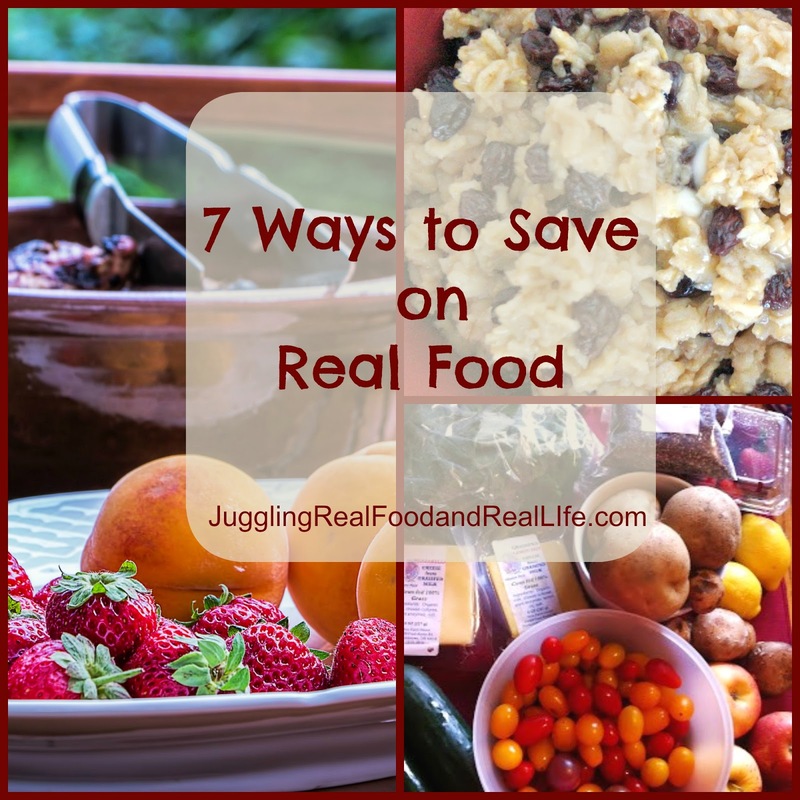 Today I am sharing 7 Ways to Save Money on Real Food. You may think one of them is couponing. That is a great way to save money, but not one that I utilize. I can never remember to take the coupons to the store and I’ve found over the years that coupons often lead me to buy things I wouldn’t normally buy. You couponers out there have some amazing skills that I do not have. These are the ways that I use to save money for my family. 1. Buy in Bulk – Oats, beans, flour………there are lots of things that you can buy in bulk that will keep for quite a while in your pantry, freezer, and refrigerator. Find a store that sells food in bulk and you will easily see a substantial savings. 2. Eat Seasonally – This one was huge for me to learn. Food in season costs less and is more flavorful. Learn what foods are in season where you live and stick to those as much as possible. Bonus Tip: Preserve the harvest. Look into buying extra foods in season to can or freeze for the off-season. I’ve been enjoying my summer tomatoes all winter since I learned to can tomato juice. 3. Shop at More Stores – Buying everything at one store can be a real time saver, but it does not save you money. Look at the weekly ads, make monthly trips to the whole-sale club, visit your local farmers market, join a CSA. Shop for the best prices. It may take more time, but it will pay off big in savings. It takes a while to develop routines, but with time…….this will get easier. 4. Shop Less Often – This one kind of contradicts my advice above, but stick with me here. Less trips to the store means less temptation to buy foods and other items that you don’t really need. Plan your meals for the week or the month and that will result in less trips to the store to pick up the “butter, olive oil, chicken” that you need for a recipe. My kids can talk me into almost anything. The less trips we make to the store, the better we will be at sticking to our budget. 5. Think About Your Grocery List – And if you go to the store without a grocery list, you need to stop that right now. We all like to toss things into the cart that we don’t really need and that will certainly happen without a list. Think about all of the money you would save if you quit doing that. Do you really need 4 different sodas and 3 juices? I saved a ton of money by switching my family to drinking water and milk on a regular basis and………. it’s healthier for us. 6. Use What You Buy – When I first started my real food journey, I bought every produce item that looked good to me without a plan to use it. As a result, I was tossing out food like crazy. Talk about a waste of money! Make a meal plan that uses up your most perishable items first. Only buy what you need. I shop for a week at a time. When it is time for me to shop for the next week………..the cupboards are pretty bare except for the bulk items that I buy in quantity. And that is a good thing. 7. And now for my favorite…………..Make your own junk food. Junk food is expensive and void of nutrition. 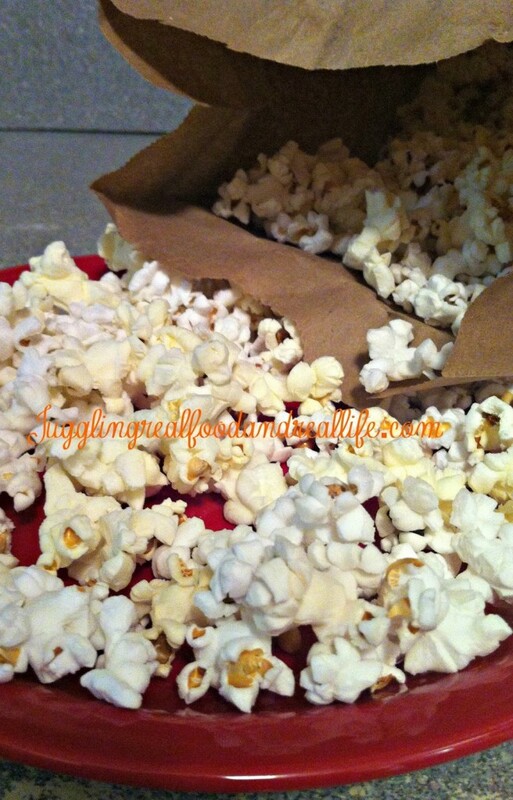 Make your own microwave popcorn and snacks and you will be happy with the cost savings and the added nutrition. Both will make you feel better! These are 7 ways that I save money on real food. These ideas really work for me. I don’t have money to throw away. College tuition is expensive and I’ve got 3 more to put through college after this one is done. I don’t see “extra” money in my budget for quite a while. What are the ways that you have found to save money on real food? Do you have a favorite real food junk food recipe? What are some of the items that you buy in bulk? Tell me I’m not alone…………have you thrown out a bunch of food and cried about it? The Juggling Real Food and Real Life Newsletter is Coming! Make sure you subscribe by email so you don’t miss a single issue. You can subscribe by entering your email address to the right of this page. Just wait to see what I have coming. Please also follow us on our various social media. You can easily find me there if you have questions. The Juggling Pinterest Boards are crammed with lots of great information and recipes. Check them out! All great tips! I try to go to the grocery store with a list, otherwise I spend a lot more than I planned on. My husband is really great at this…I should send him more often! That's funny that you mention your husband Michelle. My husband does most of the shoppng for us. He buys what is on the list and nothing else. I am very often tempted to try new ingredients. That is OK sometimes, but not when I really don't have a plan for them. I'm stopping by from the Let's Get Real link up. Love these tips! Especially the one about making your own junk food. I'm on a quest to find recipes to do just that. Thanks for sharing this post. Thanks so much for stopping by. Making your own junk food can be lots of fun. I hope you have a great time exploring new recipes. Yes, yes, yes! I agree with everything you have to say! I get tired of hearing people say it is too expensive to eat health! Pinning this! Too expensive……..I do hear it often. It's all about priorities I suppose. Thanks for the pin! Get advice! I need to work on tip 6, Use what You Buy. I have been working on reducing my waste. Too often I buy all this food at the store and don't make it all before it goes bad. I've gotten better, but it's something I need to be aware of each time I go shopping! I've found that it is important to not throw away food when on a budget. I have literally cried over rotten food. I'm nuts, I know! It is important to me to always have a plan for what I'm going to do with my fresh produce or some will certainly go to waste. I'm not perfect, but I'm getting better at it. Like anything…….it takes practice. Good luck! Thanks for stopping by Lauren. It's always nice to visit with you. Pinned! I often hear so many times that buying healthier foods is so much more expensive. Sure, it can be if you are buying prepackaged items with special labels that say light, low fat, fat-free or even gluten free. Those baked chips cost $3-$4 a bag here but I can buy a giant bag of apples or orange for that. Probably going to last me longer, too. So, it really is in how you look at things. Because I do eat a lot of fresh produce I do tend to go to the store at least every 7-10 days. But I buy bagged beans and brown rice instead of canned and 'heat and eat.' Not only is it cheaper per serving, I get more, and, its healthier. Of course it does cause for more planning. But, I tend to do all my beans at once, then store them in the freezer. It does help I have a freezer out in the garage. I believe this has saved us through the hard financial times of both of us being in college at the same time! Husband has one more month! Woohoo. Even so, I have no plans to stop my frugal ways. You and I think alike Chrystal. I have a tight budget and still buy mostly organic foods. I just need to cook from whole ingredients. Organic prepared foods are really expensive. Those I try to stay away from, but a bag of apples can last me a week to 10 days. You really know about being frugal with both of you in college. Wow! That had to be an adventure. My mom was a Navy wife for many years and that taught her to be frugal. She sticks to many of these habits even now………and Dad had a pretty good job and is now retired. The more frugal you are, the more you will have for things that really matter. Hi Melissa! It is so nice of you to drop by. My husband had gotten into the habit of shopping several times a week and it was really adding up with extra purchases. We had to cut that out……….and fast! Hi Christina, You have some great ideas and tips here that make a lot of sense. Eating seasonally not only saves you money but it is so much healthier to eat local. Making your own junk food is a great idea and something I have started doing for my husband. You know exactly what in it – don't have to worry about GMO's and toxic ingredients. Thanks for sharing on Real Food Fridays! You are so right that local seasonal food is healthier. I've found that many of my local farmers practice organic farming even though they are not certified organic. Saves me money and I avoid the pesticides. I'm guilty of the overbuy during the summer, too. It all looks so good and it's hard to decide what to buy. I can't wait to have that problem again. You are smart to take a list, Nicole! These are great money saving tips Christina. I'm really bad about going to the store for 1 thing and coming out with a basket full. I can't help myself. If I could just stay away, I'd save all kinds of money. I can attest to meal planning being a huge money saver. I've been able to shave $200 a month off my grocery budget. I was buying too much that "looked good" without a plan to use it and it went to waste. Isn't it amazing how much money you can save with meal planning just because you aren't wasting food? That was something I really had to work on when I changed to eating fresh produce. $200 is huge!! That's a lot of found money for just a little bit of time meal planning. I'd say that was worth it! Oh I am also guilty of throwing produce away. I do have a plan for it I just don't use as soon as I should. As we know organic goes bad faster then the GMO junk. Thanks for sharing again on Real Food Fridays, new party tonight. I used to throw away so much produce Joyce. You are right that produce does go bad much quicker than processed food. I've found that buying local gives me more time. Who know how old the produce is by the time it reaches the grocery store. Planning has helped me quite a bit also. I loved your information so much that I choose it as one of my featured posts on Real Food Fridays Blog Hop this week. Hope to see you there. Thank you so much for your kind words and the feature. Spreading the word of real food is work, but it is sure worth it!